Reuters reports that Syria will set up an investigation into the protest deaths, as well as form a committee to “solve the problem of the 1962 census” during which 150,000 Syrian Kurds were denied nationality. It is doubtful that an investigation will be regarded as hopeful by protesters whoblame the violence on Maher al-Assad, brother of the Syrian president, one of his closest advisors and head of the Republican Guard. While Bashar al-Assad is the public face of Syrian governance, his brother is in charge of the security forces that provide Syria with one of the worst human rights and press freedoms records in the world. One of the many things he is commonly accused of is shooting his brother-in-law Asef Shawket (Directory of Military Intelligence) in the stomach. Along with Rami Makhlouf, a cousin of Bashar and Maher al-Assad who controls much of the Syrian business (including SyriaTel) and foreign investment and is under US sanctions for public corruption, Maher is also suspected of public corruption. A video circulating shows a group of dead bodies and what it says is “the killers, or the killer himself, it shows President Bashar Al-Assad’s Brother (Maher Al-Assad) with his personal guards walking over the raped apart bodies and taking pictures with their cell phones.” (at 1:05). 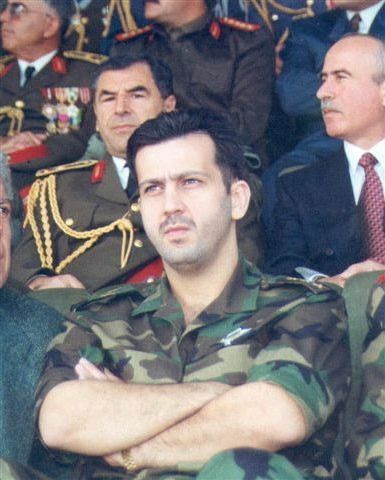 While there is no indication of the circumstances of the deaths and there could be many reasons for the picture taking, Maher al-Assad is a hated and feared public figure. While many people can still be found to defend president Bashar al-Assad, there are few defenders for Maher al-Assad, brother in law Asef Shawket, or cousin Rami Makhlouf who between them control the military, intelligence and commerce. And for the protesters who have been saying since the beginning that their protest is not against the president but against the security forces and the emergency law, it is Maher al-Assad and his brother in law Asef Shawket they are referring to. This entry was posted in Wikileaks Central and tagged Analysis, Crimes Against Humanity, Maher al-Assad, Protest, Revolution, Syria. Bookmark the permalink.